Doesn't render method control whether the GUI hardware accelerated as well as playback? If so doesn't then belong with similar settings such as resolution, limited colour range etc. Nope, its id is "setting id="videoplayer.rendermethod" and this is correct. Compare with limited colour: "videoscreen.limitedrange"
The id's are based on the code design, that does not mean settings with similar id's should necessarily be grouped together in the UI, these proposals are to make things easier for the novice and what items they would expect to see together. To be honest the whole Accleration section seems overly complicated, but maybe I don't understand what render method and the enable hardware acceleration toggles do differently, as most other video players I've seen have a single global enable hardware decoding\acceleration setting. Of course it does. Videoplayer settings should not mixed up with settings of any other component. Actually it is not based on code design but the code follows a logical design. Try to put it in words. 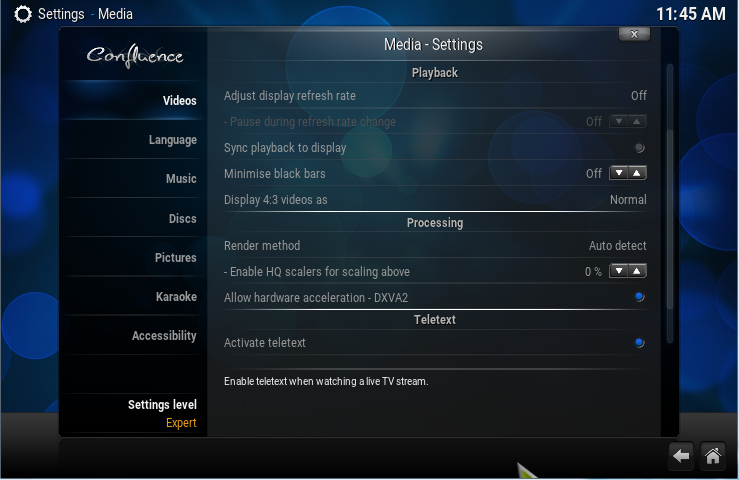 Why do you want a setting that is videoplayer ONLY mix with other settings from different components? Assume this particular videoplayer needs to be exchanged with a different one with different properties. It would be an unmanageable nightmare. These are mostly only xml changes, so nothing a quick find/grep wouldn't turn up, anyway you've convinced me on this one so I'll do another shuffling of things around, and from your previous comments and some I received at Devcon I'll also shuffle the stuff I moved to Device back to System and maybe promote that to the top. Hope I'm not being too much of an annoyance, but I'm challenging the status quo from a user perspective in some cases to make sure we get these things in the right position in the structure for the user, of course I also want the devs on side and not create additional work for them, however for me the best user experience should always be the primary goal. Challenging the status quo is always good and much appreciated. Thanks you for doing this. This looks ok so far. Why do we have teletext not under TV? I think we can get rid of rendermethod, can't we? I can't think of any good reason why someone wants to use software rendering and not the best method available. Why isn't there a single hardware acceleration enabled/disabled toggle? is there any valid use case for software renderer and hardware decode? or hardware renderer and software decode? I did wonder about Teletext, it was in the Videos -> Playback before which is based on so left it in, my uunderstanding is that TS recordings containing teletext could be in videos source at time before pvr made it into master. However I really don't under the usage case here either, so I'd be happy to see it gone entirely to reduced number of settings. Software rendering actually means not making use of shaders but having yuv-rgb conversion done by the CPU. This code path must be a remnant from the really old days. It can't be taken for most hw decoders because they don't allow getting data back from GPU to system memory. Consider this path as dead and deleted. If I am not mistaken only Windows has more options: DXVA and Shaders. But I doubt there is much need for DXVA decoding in combination with shaders. Maybe move this to as.xml.